Imagine being chosen to participate in building an architectural wonder that has changed the face of the city of Helsinki. 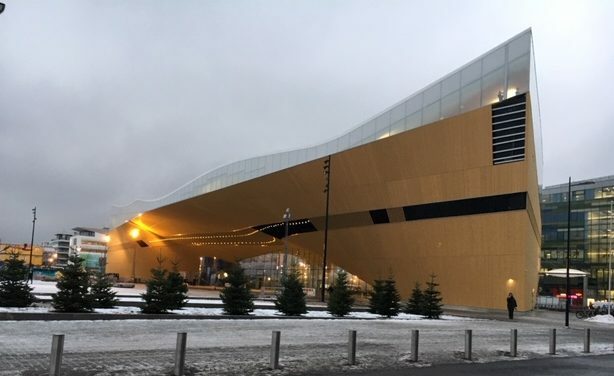 The new Helsinki Central Oodi Library, or “ode” in English, opened its doors to the public on December 5, 2018, one day before Finland’s 101st anniversary of independence. 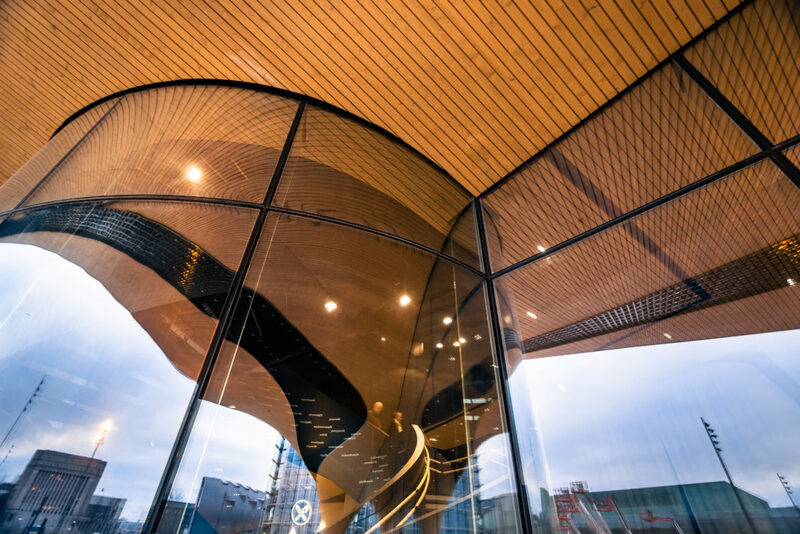 This poetry in architecture, one of the most advanced structures in the Nordic countries, Oodi Library exalts the very elements of glass, wood and steel that work in balance as a free-standing masterpiece. This monument in Finnish architecture began with ALA’s entry as one of 544 in an anonymous international architectural competition in 2012. In June 2013, they got the good news: they had won, and construction began in September 2015. The style of each floor has been designed to elicit varying experiences, with three different floors intersecting with each other via escalators and curved stairways. The use of glass differs in abundance, style and function for each layer. 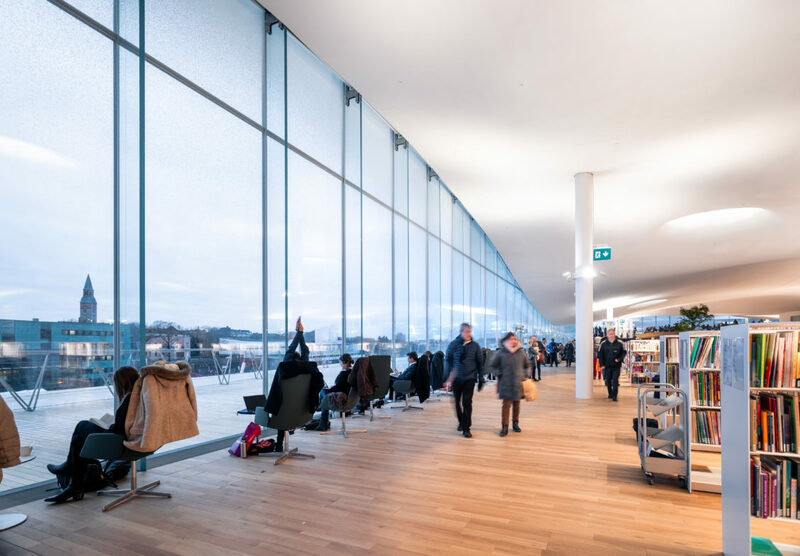 In the transparent parts of the ground floor, glass works to eliminate any visual boundaries between the street, public life and the inner library space. Huge sheets of tempered and laminated glass – both bent and flat – have been used to create the illusion that the outside blends into the inside as one continuous environment. The middle floor acts something like a book in between the cover of the others, offering a more private space for functions with varying and specific needs. The top floor is book heaven, like being in the clouds, with panoramic views of the surrounding cultural and media hub buildings, including Finlandia Hall, the Helsinki Music Centre, the Sanoma House and the Kiasma Museum of Contemporary Art. “Again, we aimed to create an upper space as clear and light as possible, almost so that the glass is invisible, without any noticeable steel parts,” Mahlberg says. Wrapping around the walls of the top floor of triple-gazed white fritted glass, with every pane and print pattern being unique. 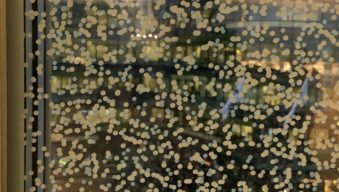 “We printed one white dot pattern on the outside pane and another on the inside pane to give depth to the pattern and cut the glare and excessive heat during the summer. A regular dot pattern would have caused a feeling of dizziness, known as the moiré effect. But using a completely random pattern eliminates this problem,” says Mahlberg. In fact, the printed result now closely resembles abstract snowflakes falling softly around the entire structure. The white fritting was a challenge, as there were not many options to choose from for both the outside and inside of the building that could endure the Finnish climate conditions. Also, the large panes of flat glass used along the swooping, wavy roof presented their own set of issues. The Estonian glass processing company Klaasimeister AS was selected to provide all flat glass panes for the façades, including IG units and tempered laminated glass, produced on a Glaston line. According to Kaido Toonekurg, Product Manager at Klaasimeister, the biggest challenge was producing all the types of glass needed for the project. 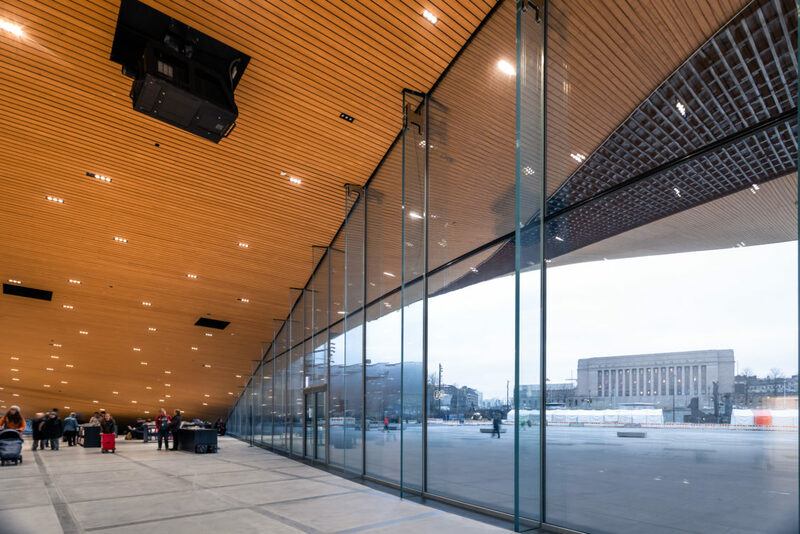 Klaasimeister has supplied flat glass to other well-known buildings in the Helsinki city center, so they know the surroundings well. “Still, each project brings something special. Oodi enabled us to reach a completely new level of complexity and magnificence that we’re proud to have provided,” he says. The huge and heavy bent tempered and laminated glasses were supplied by Tambest Glass Solutions Oy of Finland. Although there were lots of changes along the way, a solution for the tempered and laminated bent glass was ready about a year before construction began. The safety aspects adhere strictly to building regulations. “When you have 70-mm thick glass extending from the ceiling to the floor, it has to be safety glass. Each glass is toughened and laminated in a way that makes the entire structure stronger,” he says. Glass clarity was an important issue. If standard green glass had been used, the hue would have been visible. “That’s why we chose low-iron glass with solar coating to cut back on the solar heat. Since solar films are normally dark grey, the glass print pattern helped us use lighter coatings,” Mahlberg continues. Not only was the glass important to Niklas Mahlberg, but also how it worked in concert with the wooden façade. “I was heavily involved for four and a half years in the development of the wood façade with Aalto University. The use of so much glass helps you see the wooden sculptured mass seamlessly from the outside to the inside,” says Mahlberg. As the building is a combination of a bridge and a library, the movement of the building is especially challenging. The glass used on the top floors had to take this movement – building sway and temperature fluctuation – into consideration. Therefore, all the glass structures had to be designed to absorb this movement.